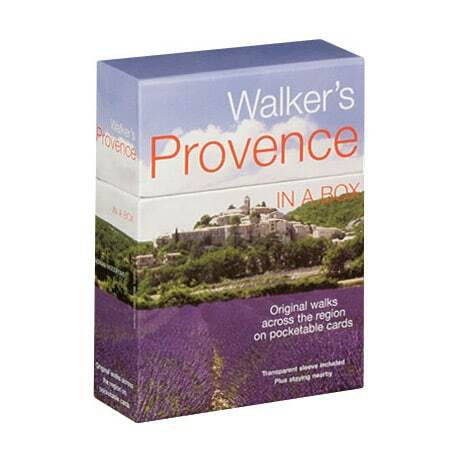 There are 35 half-day and full-day walking tours of Provence in this set, from a circuit around a nature reserve in the Camargue to a stroll along the villa-lined streets of the Cap d'Antibes, and a hike through the vivid ochre hills of the Colorado near Rustrel. If you've ever tried hiking or bicycling through unfamiliar territory with one of those fat guidebooks in your bag—or worse, your pocket—you will immediately grasp the unique charm of these guides to some of the most beautiful places in the region. The tours are presented on individual laminated cards with color photos and maps, full descriptions and directions, points of interest, and charming local accommodations. The boxed set also includes a protective plastic sleeve to help keep your card clean and dry in the event of unexpected showers.